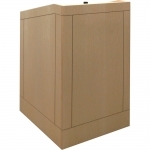 The rear of the lectern features locking hinged doors. This adds convenience and style to the access panel function. Locking panel is removed to service racks and other equipment. For security, locks may be keyed differently than the cabinet. 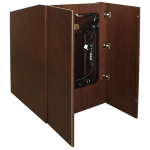 The panel lock is controlled by a cable release inside the cabinet. No locks are visible to the audience. 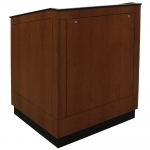 Fixed equipment rack can be installed in any opening. Rear rails are included. Ventilation is provided. Access to the rear of the rack is usually via a rear access panel. 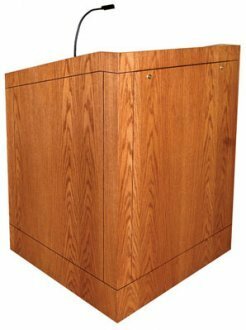 This full size service panel covers the entire face of your lectern while providing a clean front appearance without the lines. 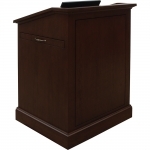 A seam is visible from the sides of the lectern.